The food co-op provides grocery assistance to singles, youth, and families in need in the Rockaway Beach, Merriam Woods, Forsyth, and Bull Creek area. Through combining education on budgeting, cooking, meal planning, and parenting with service opportunities and grocery assistance, this program strives to empower individuals in need to become self-sustaining. More than a handout, the food co-op works to help people develop sustainable, self-sufficient lives while also learning about the grace and mercy of Jesus Christ. In His earthly ministry, Jesus proclaimed salvation through Him alone, and He also ministered to people's earthly needs. It is our desire to minister as Jesus did - to share eternal hope and to meet practical needs. Anyone can take part in the food co-op. To do so means that you are willing to learn and serve through the food co-op as a condition of receiving groceries. The program is designed to provide valuable skills to help people find ways to sustain their families while also being able to receive grocery assistance while they earn and serve. Through this type of structure, participants become invested and are given dignity rather than being treated as a charity case. We see each person as valuable, loved, and made in the image of God - capable of doing extraordinary things, and it is our goal to help you reach your potential by empowering you. 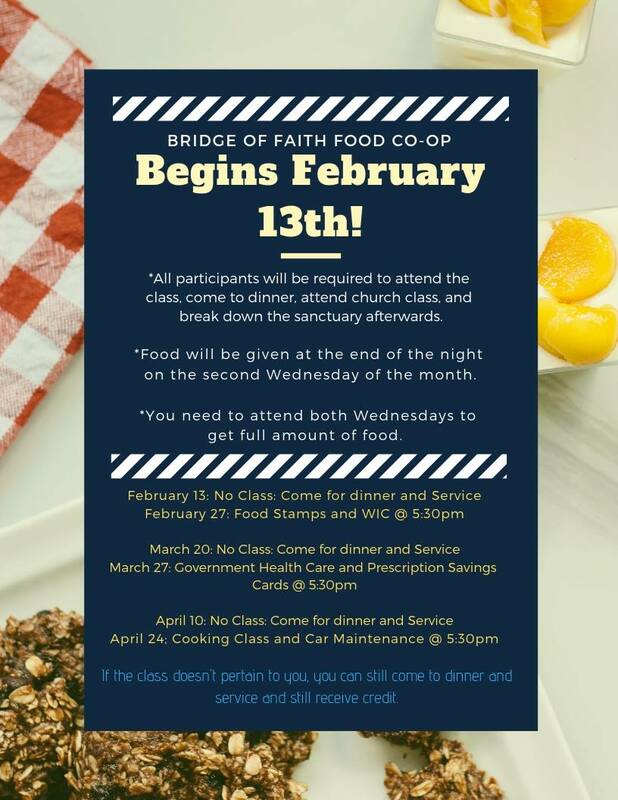 Email info@bridgeoffaithcc.com to inquire about signing up for the food co-op, or simply show up to the next meeting (posted below). Follow the Food Co-op on Facebook to learn more about the ministry and to receive updates on events. Volunteers are greatly desired in our food co-op ministry. People may serve by handing out groceries, taking part in discipleship, supporting classes that are hosted, and through various outreach events. Please fill out an application on the volunteer page to begin the process of serving in this valuable way! Supporting the food co-op through donations of non-perishable groceries helps this ministry to remain operational. Donations of canned goods, hygiene items, and toiletries are always much-needed and much-appreciated! Food donations may be dropped off during Sunday or Wednesday services, or you may call the church at 417-561-0777. Food Co-op is Restarting! We will begin on February 13th. Please take a moment to read the flyer as there have been some changes. *Food Co-Op will be twice a month. *Groceries will only be given once a month. We ask that you attend both Wednesdays to receive the full amount of food. * The first Wednesday will be dinner, service, and to help reset the sanctuary. *Second Wednesday will be a class @ 5:30pm, dinner, service, reset the sanctuary and then groceries after. *If a class does not pertain to you, (ex: You already have health care) then you can just come to dinner, service and help breakdown and still receive groceries.